Once on the brink of elimination, syphilis cases reached a 24-year high in the United States in 2017. More than 30,000 cases of the sexually transmitted disease (STD) were reported nationally that year—a nearly 11% jump since 2016. In Iowa alone, there were 101 cases of syphilis in 2017, up from 89 in 2016. Clearly, syphilis is a renewed health threat for many. 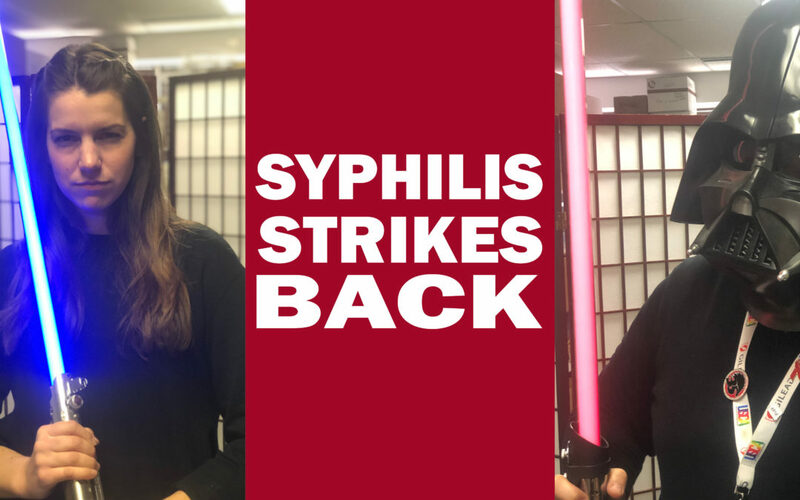 Never fear the Prevention Services team from The Project is armed with The Force, and ready to go to battle with the one and only Darth-Syphilis. While all STDs are serious and need to be treated, syphilis is especially dangerous. Without treatment, it can cause severe health problems affecting the brain, eyes, heart, and other organs. Having syphilis also makes it easier to get HIV. Know your status by scheduling your free and confidential STD/STI test at The Project. If you do test positive for syphilis seek treatment immediately, and inform your sexual partners. May the Force be with you Des Moines because we can only stop “Darth-Syphilis” with your help.